This Level 4 Certificate in Advanced Personal Training provides the key skills and advanced knowledge required to establish you as an expert. In a highly competitive market, successful personal trainers are results driven and confidently differentiate their services. Throughout the Level 4 Certificate in Advanced Personal Training you will gain a comprehensive, scientific and evidence-based approach to programming. This 12 week Level 4 Certificate in Advanced Personal Training will allow you to provide a greater level of service to all future clients as an advanced personal trainer. Meaning your training session become more focused and relevant to your clients goals. Your coaching is based on science and therefore, client results are guaranteed, which ultimately means greater client retention and attract more clients as you become an expert. Format: The is a 12 week online course with 2x compulsory professional discussions and one case study. You will be in contact with your tutor weekly as you progress through the course. Online Learning: 12x full HD video tutorials to guide you through all 6x modules of the course. These can be downloaded into MP3 and MP4 so you can learn anywhere, anytime. 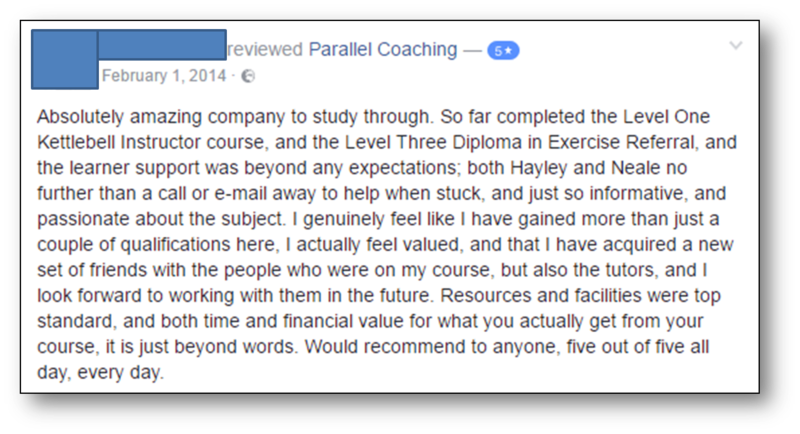 The Level 4 Advanced Personal Trainer can be started anytime with instant and lifetime access to the Parallel Coaching Academy. NOTE: This is a new certification and course modules are uploaded every Monday. All 6 modules and 12 videos are released over a 12 week period to align with the 12 week coursework. You must complete all 6 modules, 12x full HD video tutorials and 12 weeks with a live client case study. The projected finish date is 12 weeks from your course enrollment, however you can move through at a slower pace to suit you. Upon full successful completion and passing all criteria you will receive your Level 4 Advanced Personal Trainer Certificate. You will need to hold a Level 3 Diploma in Personal Training (or equivalent). You will be supported throughout your studies with weekly calls to suit your needs alongside a professional discussion (viva) at week 6 and 12 of your course. This discussion will be live via a web-link and last approximately 30-mins each. What is the Level 4 Advanced Personal Trainer? Immediate Start! - Start Upon Enrolment below. What are the 6x Level 4 Advanced Personal Trainer modules? 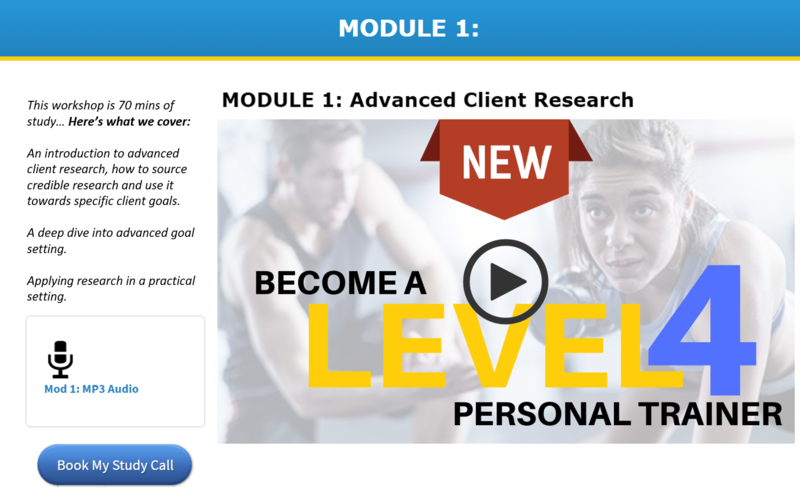 Each video module is specifically mapped to the Level 4 advanced personal trainer syllabus from Active IQ. Each module contains between 1 and 3 videos. The Level 4 Advanced Personal Trainer Certification is £499 u̶s̶u̶a̶l̶l̶y̶ ̶£̶5̶5̶0. All 12x full HD video modules, Interactive Cheat Sheets, article and resource library, MP3 and MP4 downloads, and unlimited student support and lifetime access. Sign up and pay below below using a secure international payment gateway, offering you security and an instant receipt of payment. We'll be in touch immediately to complete your enrolment, set up your personal online login and ship your course manual. Or book a call below, with Hayley from Parallel Coaching to answer any further questions. Advanced client research and goal setting: Here you will learn how to research and source credible information for specific client goals. You will deep dive into advanced goal setting and apply your research in a practical setting. Advanced behaviour change: Here you will learn the advanced methods into effective client behaviour change protocols. You will understand client motivations, client adherence and strategies to support the client towards achieving the full goal. You will also learn basic NLP (neuro-linguistic programming) principles including, framing, re-framing, anchoring, questioning and rapport building. Using technology to support clients: Here you will learn how to identify, use and analyse the effective use of recent technology and how this plays a vital role in managing a client journey. Advanced Client Testing Protocols: Here you will learn the advanced health screening, functional movement and physiological fitness tests that support your clients goal. You will learn how to execute a variety of assessment and analyse data from your case study to create specific client goals. Advanced Planning and Periodisation: Here you will learn the advanced training systems and how these fit into a logical progressed 26 week plan. Advanced Coaching Practice: Here you will learn how to confidentiality coach a client towards a guaranteed goal, developing your coaching cues, instructions and observations. You will also complete 2 professional discussions with your tutor in week 6 and 12 of your course. Each discussion is via web-link and last approximately 30-minutes. You MUST hold level 3 Diploma in personal training (or equivalent). You need access to one client that passes a PAR-Q and is available to work with your over 12-weeks. As a Level 4 Advanced Personal Trainer you will be recognised at the highest level of qualification in fitness industry. You'll be more employable to local gyms and health clubs as well as attract more clients as an advanced personal trainer. A logical progression would be Level 3 Exercise Referral which is a further gateway towards other level 4 qualifications including, Level 4 Obesity and Diabetes and Level 4 Low Back Pain. If you want to progress as a Personal Trainer and establish yourself as an expert at achieving client results then this qualification is for you. This qualification allows you to achieve the highest status of being a level 4 personal trainer, whilst working with healthy and advanced clients. If you have used one of our previous programmes to help you pass your exams, then you know that our teaching is clear and easy to understand. We also offer 24/7 support, so you can call your personal tutor whenever you need help with your studies. This course adapts to your learning style and offers accountability to help you learn and complete the qualification within the 12 week programme. Yes, all of the resources are housed on our secure membership area, you will need internet access to gain access to the modules, and supporting documents. You are able to download each video straight to MP3, allowing you to save it to your phone/ tablet/ laptop and listen over and over, without internet access. Lots of students have used this when working out, driving, going for a walk... You can save time, so there is no excuses stopping you from completing the qualification. You will also get guidance via telephone and email throughout, as well as access to a specific Facebook support group and weekly Q and A sessions.